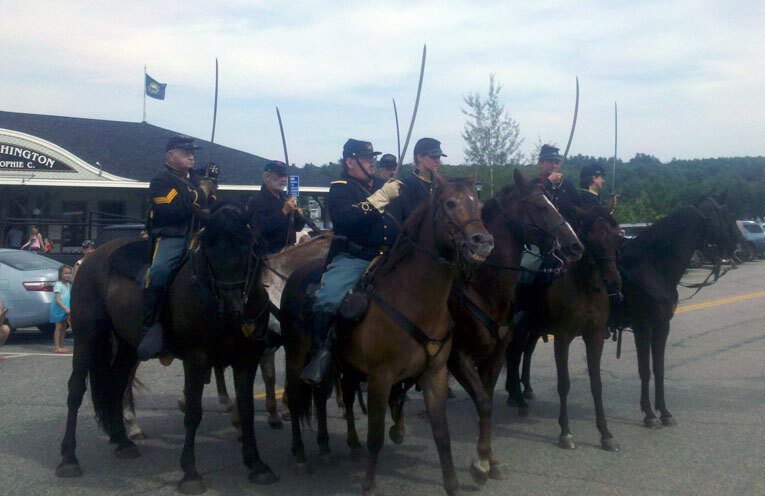 In 1875, ten years after the Civil War, the New Hampshire Veterans Association was formed. Three years later, the Association held their first annual reunion at Weirs Beach. Leasing 7.7 acres of land on Lakeside Avenue from the railroad, they constructed a series of Victorian buildings, one for each regiment, in the style of the times. 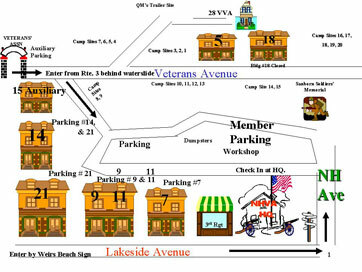 A current map of the Veteran’s Grove shows the few remaining buildings. Click here (1900) and here (1924) to see enlarged postcards of the Cavlary HQ, 9th and 11th, and 7th Regiment buildings. Known as the G.A.R. (Grand Army of the Republic) buildings, several of these grand old buildings are still standing today, including the Cavalry HQ, 9th and 11th Regiment, and 7th Regiment, L to R, above. In 1924, with assistance from the NH legislature, the Association finally purchased the large tract of land from the railroad, for $4000. 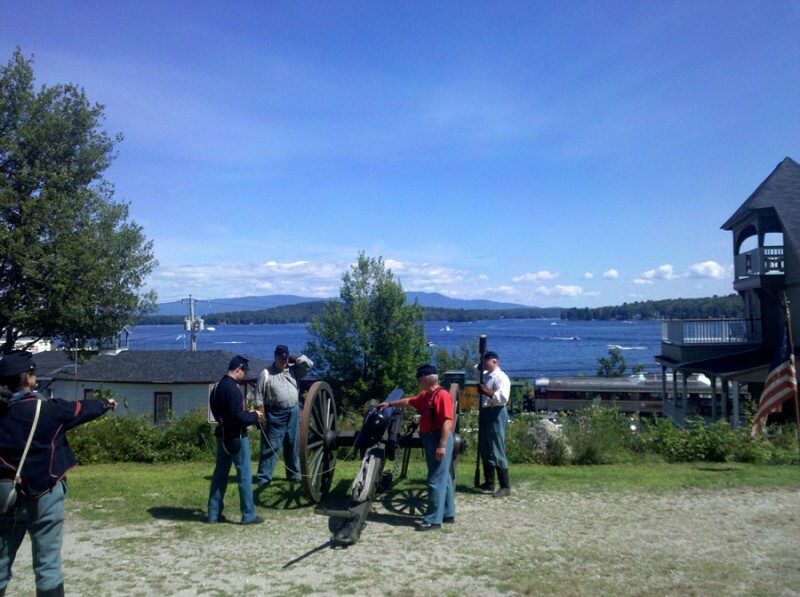 For a historical timeline of the Association, along with clickable, past and present views of all of the Veteran’s buildings, many additional historical photos, a history of the Association’s annual gatherings honoring past heroes, and an online bibliography of NH’s regiments during the Civil War, click here. 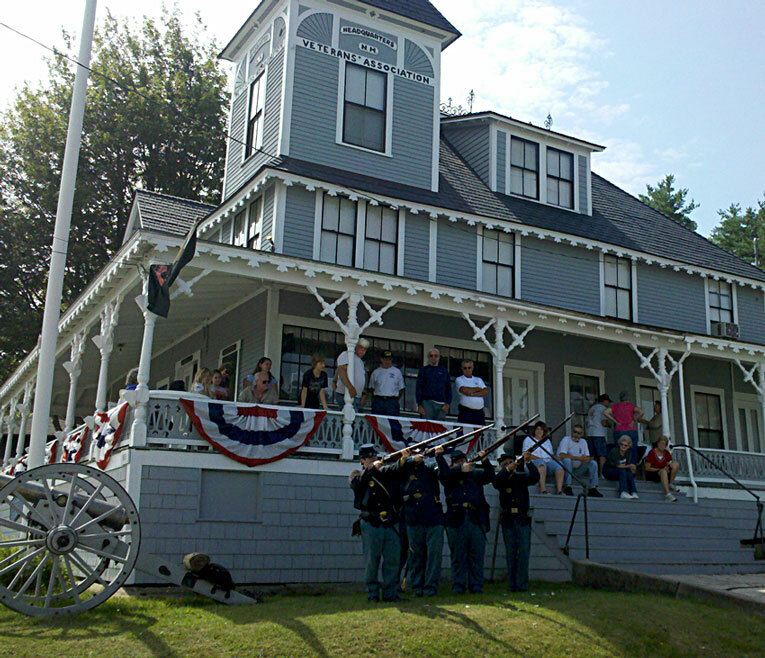 Over the last century and a quarter, the diversity of the membership of the New Hampshire Veteran’s Association has greatly expanded, while the number of historical buildings has continued to decline. In 2000, members of the Association’s board included representatives from the Sons of Union Veterans; Veterans of Foreign Wars; American Legion; Disabled American Veterans; Waves National – Granite State Unit #33; and the Vietnam Veterans of America. The buildings, which peaked around 35 structures in the early 1920s, were down to 17 when a historic district was established on May 22, 1980, and are now down even further to about 10 structures, with fire have claimed many victims. The cannon on the front lawn of the Veterans HQ is fired for the first time in 50 years, August 12, 2000. Fortunately for the train station across the street, the cannon wasn’t loaded! 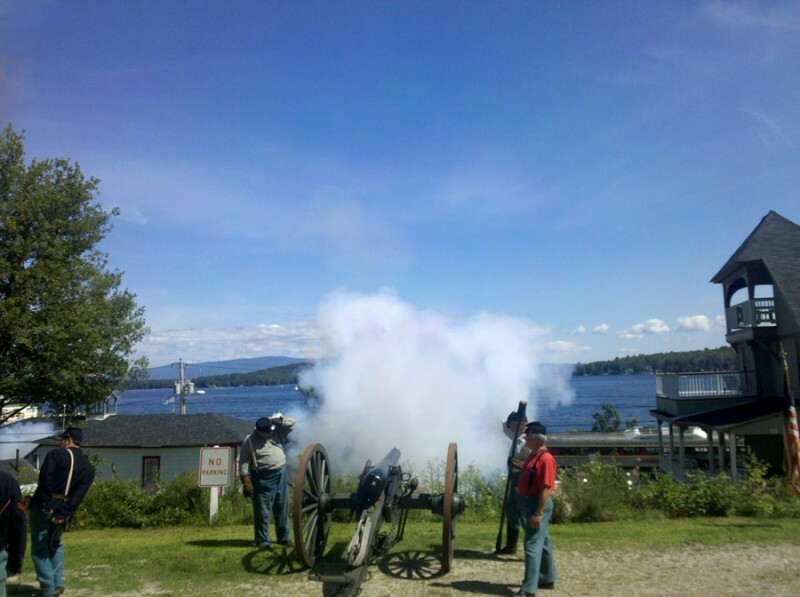 Now the cannon is fired every year during the annual reunion. 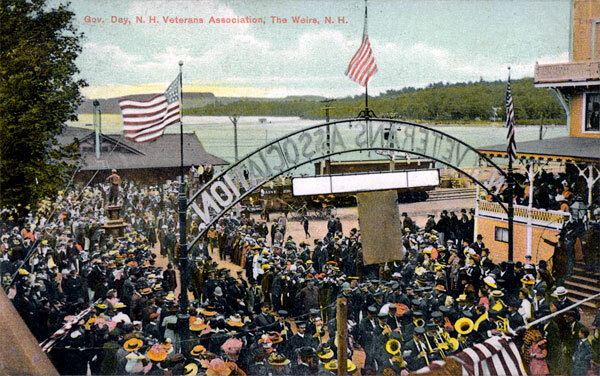 Click here to enlarge the veteran’s reunion shown in the postcard below, and to see the original black and white photo of the reunion. For the first 40 years (1879-1919), the annual veterans reunions attracted large, enthusiastic crowds, sometimes estimated in the thousands; seen above gathering by the HQ in the early 1900’s, complete with a marching band. More recent reunions have been much more modest affairs, attended at best by a hundred dedicated souls. Click here to enlarge the above photo. M.F. 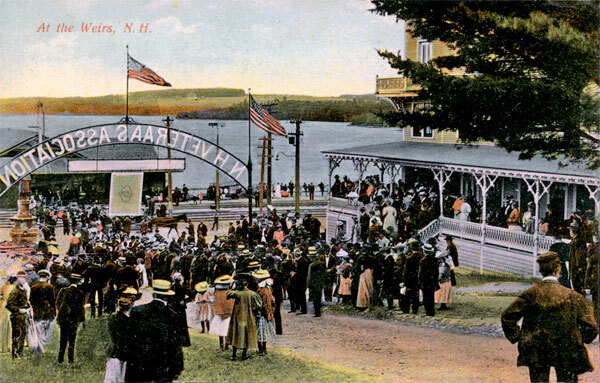 Sweetser wrote in 1889: Weirs is the summer capital of the Lake Country. The great camp-meeting grounds…have a fame that is almost national, and are occupied during the summer by convocations of people devoted to religious advancement, the temperance cause, the heroic memories of the Union-saving war, and other worthy causes, grangers, Good Templars, musicians, oarsmen, Foresters, and other fraternal men. As recently as 1870, this site was occupied only by a little wooden railway station, and all the development of the cottage city, even yet in its infancy, has gone forward since then. 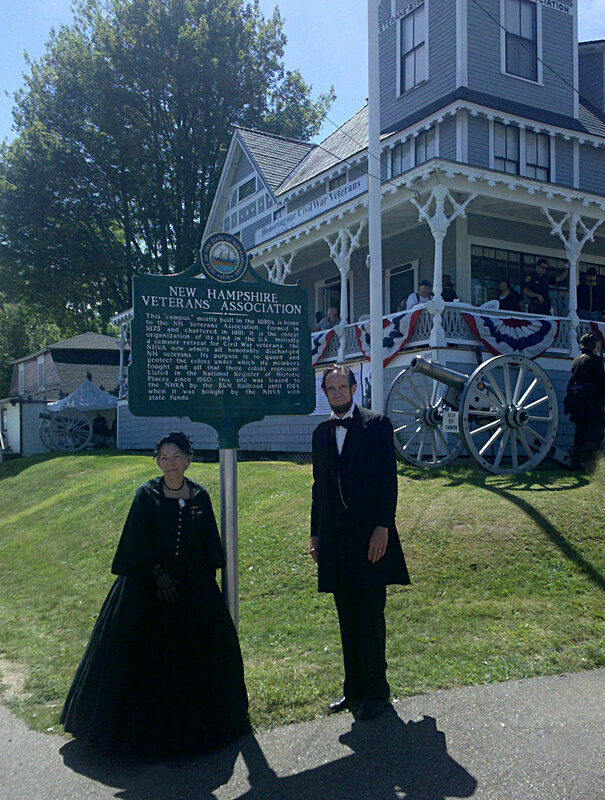 Soldier’s Mother Mrs. Phelps (Sharon Woods) and President Abraham Lincoln (Steve Woods), pose by the NHVA historical marker, with the headquarters in the background, on August 19, 2012.